The majestic Great Wall was built with wisdom, dedication, blood, sweat and tears. As one of the Eight Wonders in the world, the Great Wall of China has become the symbol of the Chinese nation and its culture. Lots of beautiful legends and stories about the Great Wall took place following along the construction, and since that time these stories have spread around the country. Beautiful stories and legends about the Great Wall help to keep alive Chinese history and culture. In each dynasty after the building of the Great Wall, many more stories were created and spread. Meng Jiangnu’s story is the most famous and widely spread of all the legends about the Great Wall. The story happened during the Qin Dynasty (221BC-206BC). It tells of how Meng Jiangnu’s bitter weeping made a section of the Great Wall collapse. Meng Jiangnu’s husband Fan Qiliang was caught by federal officials and sent to build the Great Wall. Meng Jiangnu heard nothing from him after his departure, so she set out to look for him. Unfortunately, by the time she reached the great wall she discovered that her husband had already died. Hearing the bad news, she cried her heart out. Her howl caused the collapse of a part of the Great Wall. This legend has been spread widely through textbooks, folk songs and traditional operas. It is well-known in China. This story indicates that the Great Wall is the production of tens of thousands of Chinese commoners. Another legend about the Jiayuguan Pass tells of a workman named Yi Kaizhan in the Ming Dynasty (1368BC-1644BC) who was proficient in arithmetic. He calculated that it would need 99,999 bricks to build the Jiayuguan Pass. The supervisor did not believe him and said if they miscalculated by even one brick, then all the workmen would be punished to do hard work for three years. After the completion of the project, one brick was left behind the Xiwong city gate. The supervisor was happy at the sight of the brick and ready to punish them. However Yi Kaizhan said with deliberation that the brick was put there by a supernatural being to fix the wall. A tiny move would cause the collapse of the wall. Therefore the brick was kept there and never moved. It can still be found there today on the tower of the Jiayuguan Pass. In addition to the above-mentioned stories about the construction of the Great Wall, there are also plenty of stories about current scenic spots. A famous one is the legend of the Beacon Tower. This story happened during the Western Zhou Dynasty (11th century BC-711 BC). King You had a queen named Bao Si, who was very pretty. King You liked her very much, however Bao Si never smiled. An official gave a suggestion that setting the beacon tower on fire would frighten the King’s subjects, and might make the queen smile. King You liked the idea. The subjects were fooled and Bao Si smiled at the sight of the chaos. Later enemies invaded Western Zhou, King You set the beacon tower on fire to ask for help. No subjects came to help because they had been fooled once before. Thus, King Zhou was killed by the enemy and Western Zhou came to an end. 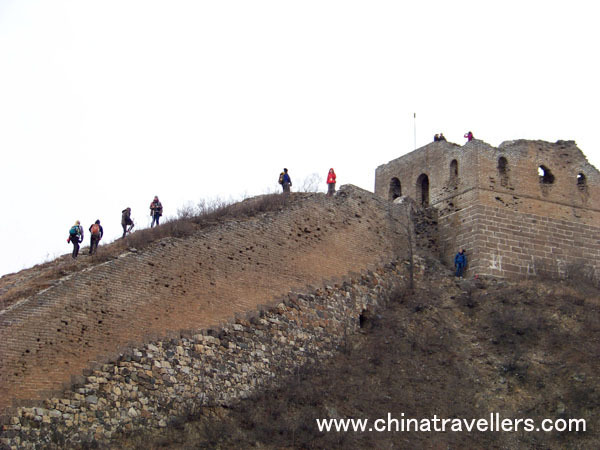 There is a fortress on the Great Wall originally named, the Xifeng Kou, or the Happy Meeting Fortress. There is story of how the name of the fortress came about. The Great Wall required soldiers to be on guard at the place all year round. Not only the soldiers suffered from this, their family members did not have a good time, too. Once, a young soldier had gone to defend the northern territory of China along the Great Wall for many years. The army prohibited anybody from leaving his duty. The young man had a father as his only family member. The father was old and feared that he might not see his son ever again. Therefore, he set forth on the visit to the Great Wall in order to see his son for perhaps, the last time. When he came to a fortress, he accidentally met his son whom had grown up. His son, too, recognized his father. The two family members greeted each other with embraces. They laughed out of joy and they cried out of grief. To everybody’s surprise, they both died on the spot. In order to remember the loving father and son, the name of the fortress where they met was named Xifeng Kou. They represented the heart of thousands of soldiers and their family. The pass where they were buried was later named Xifeng Kou Pass. 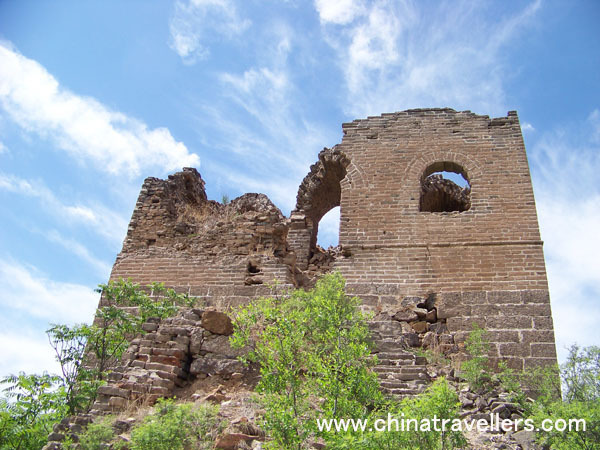 About 60 km north of downtown Beijing,, there is a famous section of the Great Wall called Huang Hua Cheng (the yellow flower fortress). During summer, the whole area would be colored by yellow flowers, hence the name Huanghuacheng Great Wall (Yellow Flower Great Wall). There is a story behind the building of Huanghuacheng Great Wall. Its construction began in 1575, during the Ming Dynasty and General Cai Kai was in charge of the entire works. It was said that it took many years to finish the construction. When General Cai Kai went to the capital and reported to the emperor his successful task, he was put to death at once! Some jealous ministers had told Emperor Wanli at that time that the General Cai Kai had spent too much money and the construction of the wall was poor. The emperor was so unhappy with these false reports, he ordered Cai’s immediate execution. Later the emperor sent a trusted aid to check Cai’s Wall. The aid went back and reported to the emperor that Huanghuaheng Great Wall was solid with the finest workmanship. Sorry for his hasty in putting the death to Cai, Wanli sent people to build a tomb and memorial stele in memory of the loyal general. The Emperor Wanli also wrote the two characters "Jin Tang"(Metal Soup) , meaning "solid and firm", carved on the face of a huge rock below the wall, showing the wall was firm and solid. 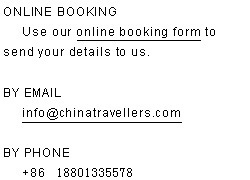 So the wall is sometimes called Jintang Great Wall.